The tried and trusted Clear Polyx Oil wood finish with added metallic flecks. The ideal solution for interior woodwork, combining the benefits of both oils and waxes to provide a very hard wearing, durable and non-yellowing finish for flooring and furniture. 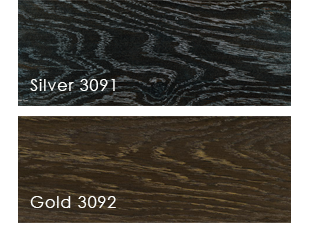 Available in Silver and Gold (images show finish on very dark woods, we advise testing a small area first, to ensure the required finish is obtained). - For Furniture and Joinery, two coats of the effect can be applied as a stand-alone finish which will give a stronger colour tone. Please ensure this product is applied to bare wood (or over a compatible Osmo product) ensuring surfaces are clean & dry. Any scratches and small holes can be filled using the Osmo Wood Filler. The Osmo Polyx Oil range is not suitable for cleaning with any steam cleaners. Areas that have worn can simply be refreshed by applying a fresh coat of Clear Polyx Oil. Areas with damage such as scratches can be repaired with a light sanding and re-application of the oil. Click the button below to add the Osmo - Polyx Oil Effect - Silver / Gold to your wish list.